The oven shown is one design of a “Core Wash” oven. Because core wash coatings are applied to various size and shapes of cores, ovens for drying these coated parts are also various sizes and shapes. Of critical concern in the design is the handling of the part and the heat application method for the particular wash coat involved. Each oven design uniquely dries the core was coating. Handling and heat application must be balanced to prevent overheating of the part or the wash coat. CONVEYOR OVENS are typically used to carry smaller parts that are only partially coated or coated on one side only. The non coated surface is placed on the conveyor for carrying through the oven heat zones. The conveyor could be a belt type or a fixture type deepending on the part characteristics. Loading and unloading can be manual or automatic via robots , pick and place, or transfer conveyors. BATCH OVENS are used for any size of parts and are generally hand loaded or use racks that may be loaded by lift truck. Batch ovens are very economical for small production and versatile for various size and shapes of product. Drying cycles are easily modified to suit new coating materials. MONORAIL OVENS are probably the most often used ovens for core wash drying. 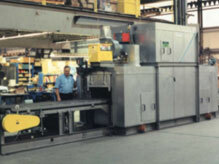 The monorail carrying fixtures can hold a variety of parts and the serpentine travel through heat chambers allows for a large production in a limited space. This design also is convenient for “zoning” and oven to apply the most efficient heat during a cycle and economize on fuel usage. Systems using monorails are typically continuous through all of the processes in the plant. Once a part is loaded it remains on the monorail until complete. TOWER OVENS are a unique way to dry wash coat on various size parts using more plant height than floor space. The part is loaded onto a holding fixture at one end of the oven. It is conveyed upward in the “tower” through heated zones and then down through a final cooling zone to be unloaded at the other end. Sometimes referred to as a “Ferris wheel” oven this design is very efficient and practical for production flow an economy of plant floor space.